This week for Caturday Connections I’m delighted to introduce you all to a real life furry goddess, the amazing Artemis! 1. Tell us a little bit about yourself. I was rescued when I was about 8 weeks old, I was stuck in the engine of an old truck, in Limni on the Greek island of Evia. I yowled and screeched for ages and ages before the humans found me and took me back to their boat. They washed me in the galley sink as I was covered in oil. I am named after Artemis, the Greek goddess of the hunt and the moon. I live on their yacht, Fandancer, for most of the year, but I have also travelled on planes and trains across Europe, as they want to come back to UK for the winter to see little annoying people they call grandchildren. 2. How do you spend an average day of your life? Obviously I have preferred places to sleep in the day, such as on the towels or the comfy cushions, or in the middle of the humans’ bed. But occasionally I have a big stretch, a nibble of food, then I like to go ashore and explore. Sometimes I go on other boats and everyone loves me as I am super cute. Then I might wander into a taverna, or find a friendly fisherman who might throw me a fish. 3. What’s your favourite thing to do to? I love tormenting the local dogs. They don’t scare me. I go right up to them, and they can bark in my face but I just give them a withering look. Then I turn my back on them and saunter up the gangplank and carry on staring at them from the aft deck. 4. Tell us about who you live with? Do you like them? 5. Do you prefer spending time on land or on the boat? I’m very happy on the boat, but I like dry land too. In the winter they take me back to England and it’s so cold! I grow a thick fur coat and sleep under their duvet. 6. Where’s your favourite place on the boat? I like to sleep in the shade under the dinghy on the foredeck. 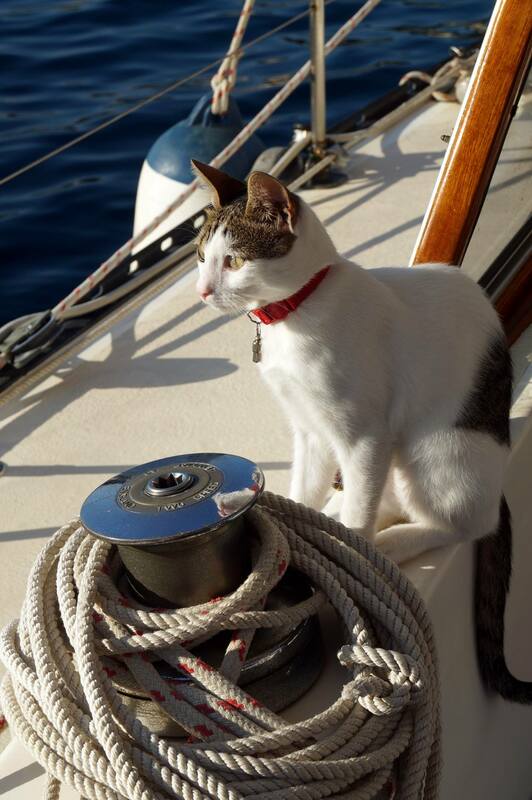 I also like posing on the aft deck when we are moored stern-to, and I like to count how many people take photos of me. My record is six cameras at once when we were moored in Gaios, Paxos. 7. I’m sorry to lower the tone, but as a boat cat myself one of the top questions I get asked is…Do you ever get sea-sick? I was sick once, but I think that was due to the rotten fish I ate before we left harbour! I do feel queasy sometimes, but I snuggle down in my favourite basket in the cockpit and I’m fine. 8. What’s the strangest thing you’ve ever seen whilst sailing? We anchored once in a quiet bay and I saw the male human skinny dipping….. Oh, I’m probably not allowed to say that, (LOL) so another strange thing was a huge turtle swimming alongside us, his head was bigger than a football! Perhaps I shouldn’t tell you this, as the humans have never proved it, but we have old fashioned stainless steel sinks in the heads, and I like putting my paw down and pulling out the metal drain insert. Then I chase it round the sink as it makes a lovely scratchy noise. Once I had it in my mouth, jumped down off the side, and I dropped the little strainer into the toilet! I slunk away and never told anyone. A few days later after the usual pumping palava, the loo got blocked and the male human had to take all the pipes and valves apart. After a day of swearing and cursing, he found my metal drain insert wedged in the pipe so he had to fish it out and renew the valve. Oops! 10. What do you think your next big adventure in life will be? Well, I’m currently in England but the humans are getting ready to go back to Greece. They are taking me on a plane again. It’s very annoying being in the cat carrier and I try to yowl as loud as I can for the whole journey. It’s because I’m hungry as they wont give me food that day! I like making loud noises so everyone on the plane turns round and glares at the humans, who get embarrassed and try to deny my existence. 11. If somebody asked you for advice and you only had a few minutes to give them your best tip, what would it be? Show that you love your humans by catching the biggest mouse, lizard, cricket or beetle that you can find. They will be so grateful, especially if you take it to them when they are in bed at 4am. 12. Do you have a website or social media channel where we can follow your future adventures? The female human has a blog, with a page about me. She often writes stories about me! Wow! What a pawesome life Artemis! Thank you for sharing it with us all. Thank you to your humans too for the wonderful photos! You’re really beautiful. « Getting the humans back up to scratch! Thank you Baile you. Thank you Artemus. You have an interesting life. Artemis is just lovely, Bailey. Thank you so much for bringing us her story! 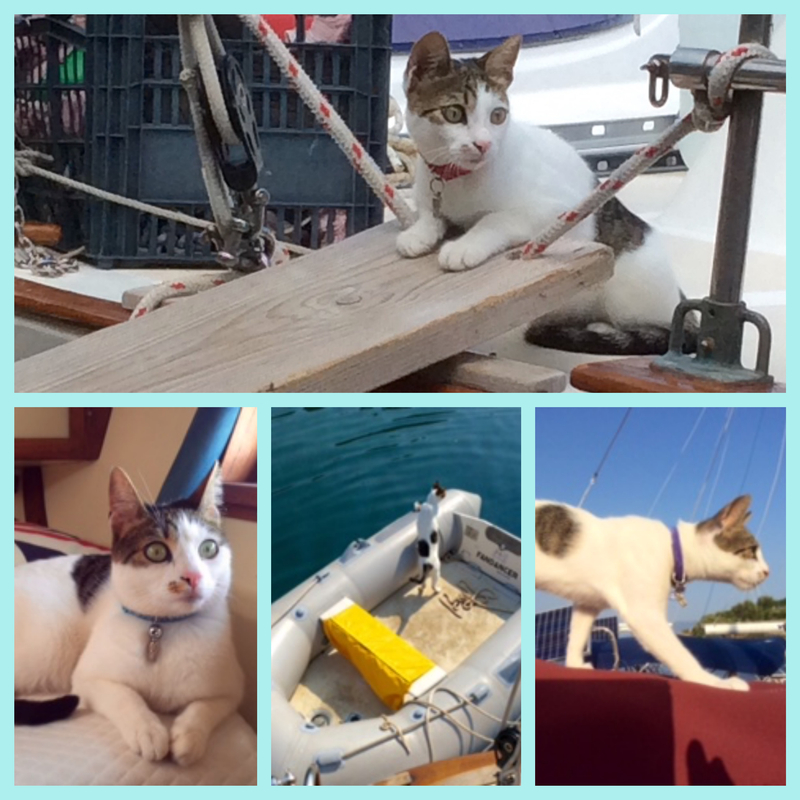 Artemis the boat cat – here’s a story! Lovely read. I smiled my way through this. Artemis, she’s a gorgeous kitty. 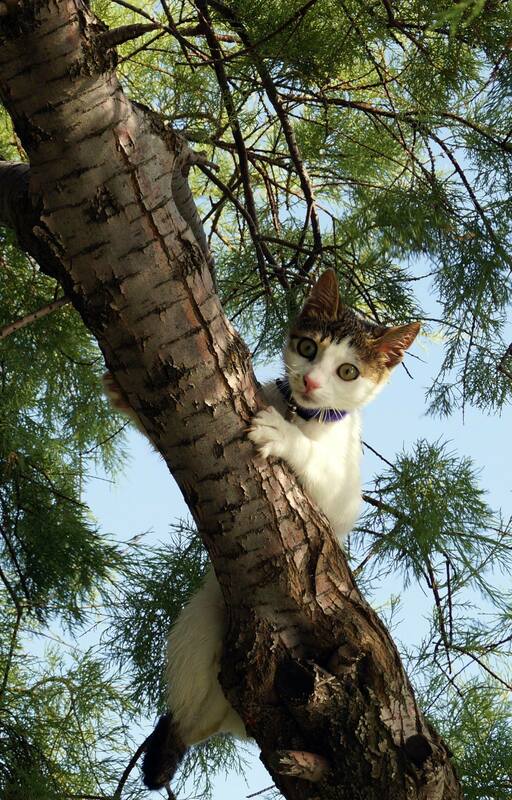 I loved your interview with Artemis – she sounds like a very fun girl! Atremis is beautiful! What a great interview!! Its always fun to learn about boat cats!! Thanks for introducing us to Artemis, Bailey. She is very pretty. Great interview. So nice to meet Artemis. I will check out the blog and Facebook page. I think Artemis would make a good girlfriend Bailey! Good interview, Bailey, and Artemis, good stories – especially the naughty deeds!